The CI/CD extensions available on the marketplace. This makes possible to enforce security controls as from CI builds, so very early in the application lifecycle. On top of Azure DevOps extensions, the kit also ships with Visual Studio extensions to provide security guidance as the developer is typing the code. A lot of room for customizing control settings, creating organization specific controls, etc. It is free, the only costs you might have would be incurred by a few resources (Storage Account & Automation) that are required to use the kit but overall, it is very low. Today, most companies have at least some workloads in the Cloud but sometimes at the cost of a long and tortuous journey. Here are some guiding principles that I think are important for a successful or at least, less painful journey. The below sequence is more or less logical but activities relating to different principles could be executed in parallel. 1. Understand well your business drivers. #ITDevConnections is approaching. 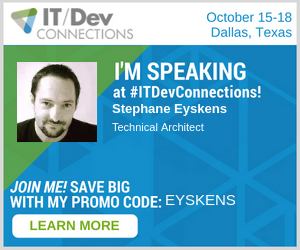 Join my sessions where I plan to make some exciting deep dive demos. These three talks can be attended separately or all together since they are somehow linked and part of the same story but you can perfectly afford to attend only one of them and still (hopefully) grasp the overall concepts! Enough talking, in talk #1, you will learn how to build Custom Azure DevOps Extensions(building/versioning/debugging) and complexity will increase over time since we’ll end up with building custom Service Endpoint Types talking to API Management or to custom APIs through Mutual Authentication, in other words, letting Azure DevOps talking to any backend of yours in different manners. In talk #2, I have an awesome demo showing how to tackle all the aspects of an application lifecycle from Development to Security & Operations (DevSecOps) with security bits in the picture (MSI, API Management, Azure KeyVault, Azure AD, Network isolation, etc..) and Operational aspects such as Log Analytics & Azure Automation runbooks, everything fully automated and integrated into a single release pipeline. We’ll start from nothing and we’ll have a fully functional application relying on a secure architecture with the basic monitoring blocs in place. I’ll also make a few demos of Azure Automation. In talk #3, I’ll discuss one of the most challenging topics when it comes to automation: identity. Here again, I’ll show you how to have an end-to-end Enterprise-ready automation of identity-related things (MSI, OpenID and OAuth together with Key Vault). We’ll start simple and we’ll end up with a complex scenario implying user & group assignments. A while ago, I have published a free VSTS extension to automate deployments towards Azure API Management.